HOUSE PROUD: Prosenjit Chatterjee in a relaxed mood at his plush Ballygunge residence. Sipping on a can of Schweppes Ginger Ale, Bumbada took us around a few cosy corners of his four-storey house which has 34 rooms (yes, you read it right). While the ground floor is occupied by his office (nideas, Prosenjit Chatterjee’s production company), the first floor has two huge living rooms, two bedrooms and a master bedroom that belongs to Prosenjit Chatterjee alone, a lounge and his puja room, plus a guest room and a study. The second floor has three living rooms, two bedrooms, two guest rooms and a make-up room. The third floor has lounge areas, bedrooms and the dining space. The top floor has a tiny DVD room tucked away inside his spacious home theatre, a gym and a lounge. FAVOURITE COUCH: This third-floor room, or rather the couch, is where Prosenjit Chatterjee spends maximum time when home. “I love watching TV in this room, in fact Arpita and I like having dinner here too. When friends come over, we have great adda here. This is undoubtedly my favourite space in the house,” he smiled. FRAMES, THEN & NOW: “Would you like to take pictures with Ma (Ratna Debi) and Bapi (Biswajit Chatterjee) in the background?” Yes, we say. The black-and-white photographs of the entire Chatterjee family adorn one half of Prosenjit Chatterjee’s study. ROOM WITH A VIEW: There are very few days in a month when Prosenjit Chatterjee can actually lie sprawled on his couch, watch a film or look out through the large windows at the greenery. “When I am not shooting, I have meetings with directors and producers at home. I start my day as early as 7am, though I don’t go to bed before 2am! I hit the gym (Solace) around 8am. Then I come back, take a walk in my garden, go for a shower and have breakfast. Spending time in this living room (on the third floor) and watching the day pass by is a luxury. But thanks to t2, I could spend some me-time today,” he smiled. SHOEBITE: Prosenjit Chatterjee shows off his collection of shoes stashed away in the five drawers of one of the bedrooms (on the second floor). 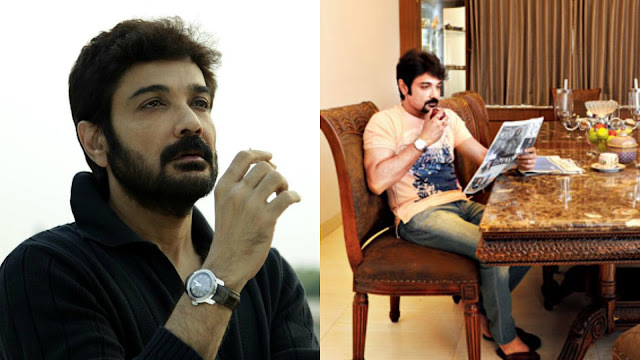 LIKE A PRAYER: Before stepping out, Prosenjit Chatterjee makes it a point to spend some time in his prayer room. AN APPLE A DAY: No, he is not a tea or coffee addict, so Prosenjit Chatterjee begins his day with an apple. DVD WATCH: A DVD a day keeps an actor aware, or so believes Prosenjit Chatterjee. “Of the 30 days in a month, I watch films at least 27 days. The Godfather is my all-time favourite,” says Prosenjit Chatterjee, pausing at a scene from The Godfather Part II. This lavish home theatre is on the top floor.